JustGo (www.justgo.com), a revolutionary social media platform for the music and entertainment industry, today launches its full suite of tools to the public. 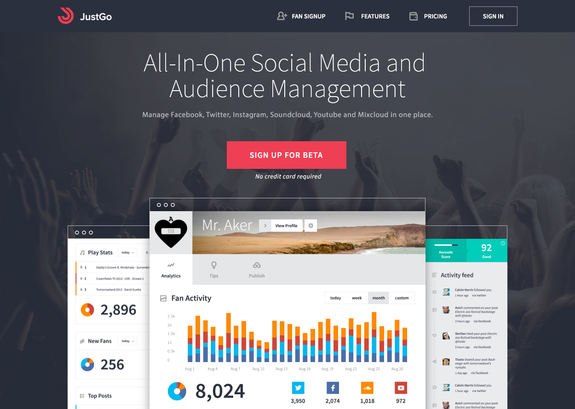 JustGo places the control and analytics of all your social media accounts at your fingertips (Facebook, Twitter, Instagram, Soundcloud, Youtube and Mixcloud). From a uniquely designed user interface, you can post or upload content to one or multiple accounts, while managing social statistics to understand how your audience is engaging with your content. With three plans to get you on board, including a free start-up option, JustGo is just as accessible for the bedroom musician as it is for top talent. Tutorial: JustGo Music’s DJ marketing & social media tools from JustGo Music on Vimeo. Launched in April 2013 in Shoreditch, London’s answer to Silicon Valley, JustGo has quickly positioned itself as dominant force in social media for the music and entertainment industry. JustGo launched its beta exclusively focused on the electronic music industry and already boasts a user base of more than 50,000 including industry icons such as Armin Van Buuren, Above and Beyond and rising EDM star Arty. The creators registered on JustGo represent more than 165 countries and have a combined social media audience of more than 120 million fans throughout the world. Beatport’s Co-Founder and Former CEO, Jonas Tempel. has joined as Chairman to provide the company with strategic direction to help the JustGo team’s expansion plans. JustGo’s team brings a wealth of experience to the table from prior careers at companies such as Beatport, Timeout, Shazam, Nokia Music and Spotify. “The idea for JustGo came about two years ago while I was studying music production and sound engineering in Point Blank Music College in London. I was a bedroom DJ/producer hobbyist working a full-time job and realized how tough it must be for other emerging creators to promote themselves online. I wanted to create a new plaIorm that would help these creators connect with and grow their digital audiences in one simple to use interface.” said JustGo’s Founder and CEO, Justin Golshir.